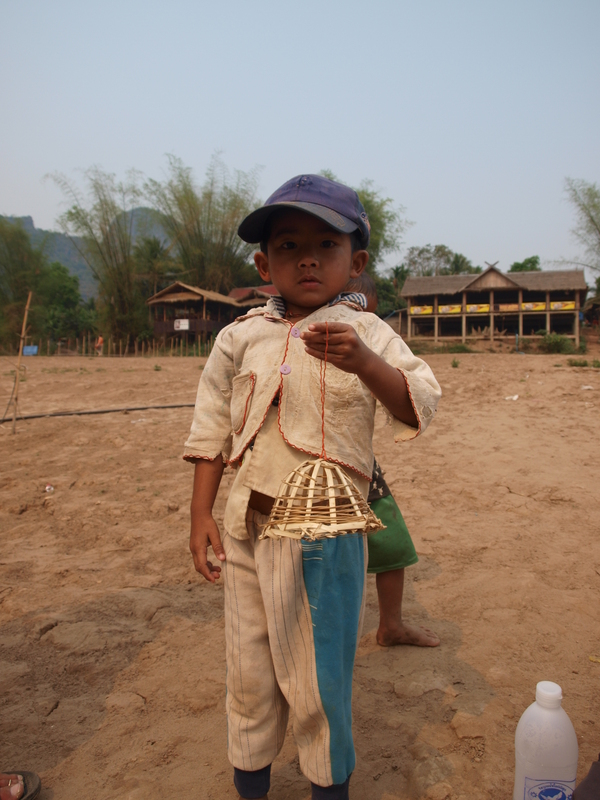 Upon hearing we were headed to Laos, a lot of our friends and family from home asked, ‘Laos? Why are you going to Laos? 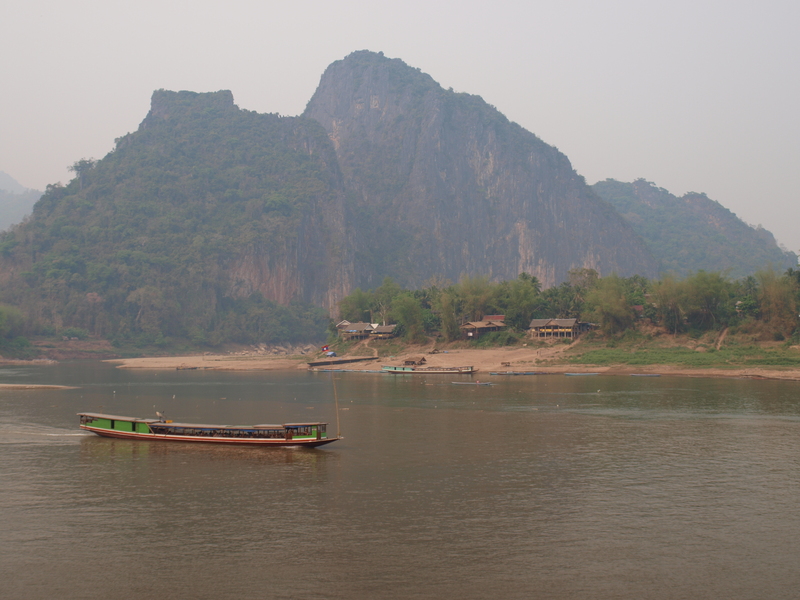 What’s in Laos?’ It seems to be a country that not many Americans know much about. Wedged between Thailand, Cambodia, and Vietnam, Laos is a small country that during the Vietnam war, the USA dropped over two million tons of bombs over Laos, destroying villages and displacing thousands of citizens. In addition, a large percentage of the bombs failed to detonate, leaving behind contamination from the unexploded bombs , which has injured or killed thousands of Laotians since the end of the war. However, despite its grim past and current poverty, Laos is a beautiful country with friendly people…we looked forward to exploring and seeing what it had to offer. 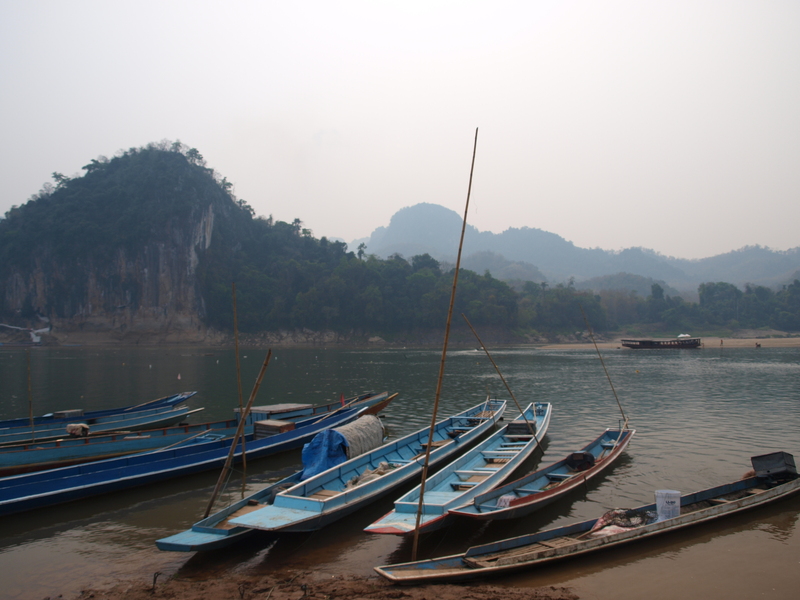 Crossing the Mekong in a longboat, we arrived at the Thailand/Laos border, had our passports stamped, and began the long and bumpy bus ride to Luang Prabang (there are very few paved roads in this country…it took us nine hours to go around 60 miles). 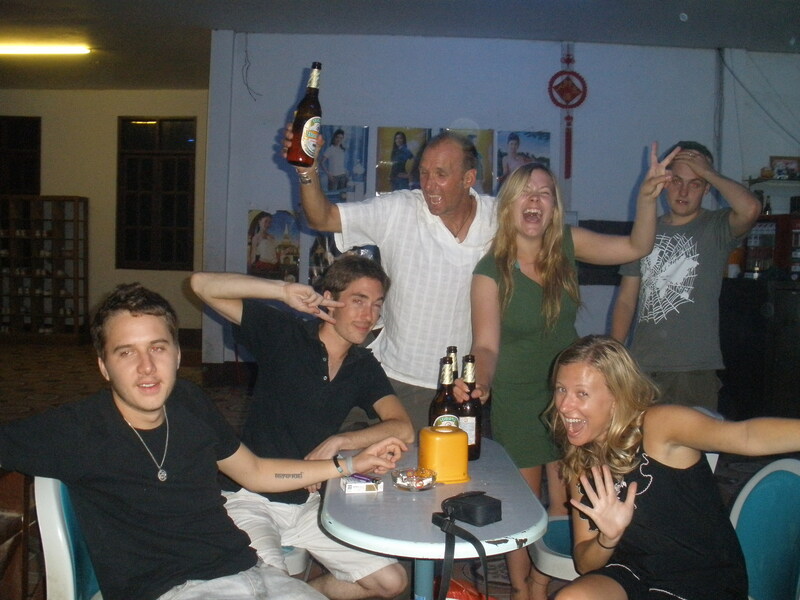 Along the way, we made friends with Megan, a fellow passenger from Denmark that was travelling for a few months around India and southeast Asia; she would turn out to be our travel buddy through the majority of our time in the country. We arrived in Luang Prabang around 10:30 p.m., checked into the first reasonably priced guesthouse we could find, and passed out. Our first couple of days we spent making new friends and exploring the town…Luang Prabang is so quaint and charming, it almost makes you want to throw up. Situated between the Mekong and Nam Khan rivers, its cobble stone streets are lined with cafes, shops, Buddhist temples, and buildings inspired by French architecture. There is an extremely slow pace of life here…all the restaurants and bars close up around 11 p.m. and the only late-night action after that is the local bowling alley (it only has 5 lanes…ha! ), which of course we had to check out. At the bowling alley. I bowled a 13. 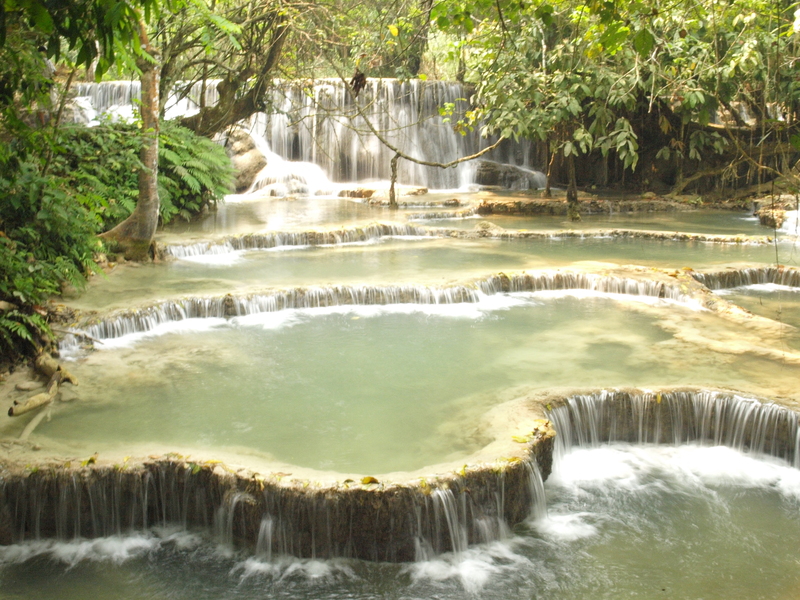 One day, our group took a trip to the nearby Kouang Si Falls to walk around and do a little swimming. It had rained the night before, so the pools were a little murky, but still incredibly beautiful. Kelly and I jumped off one of the falls and Megan did the rope swing. Fun times. A couple of days later, we booked a one-day trek that involved a hike through the jungle, lunch in a mountain village, and kayaking on the Mekong. After a month of laying around on beaches, the trek was a bit difficult, not to mention crazy…we were climbing over huge boulders, fallen trees, and walking through leech-infested forest. We made it to the mountain village where we had lunch at a local’s home. 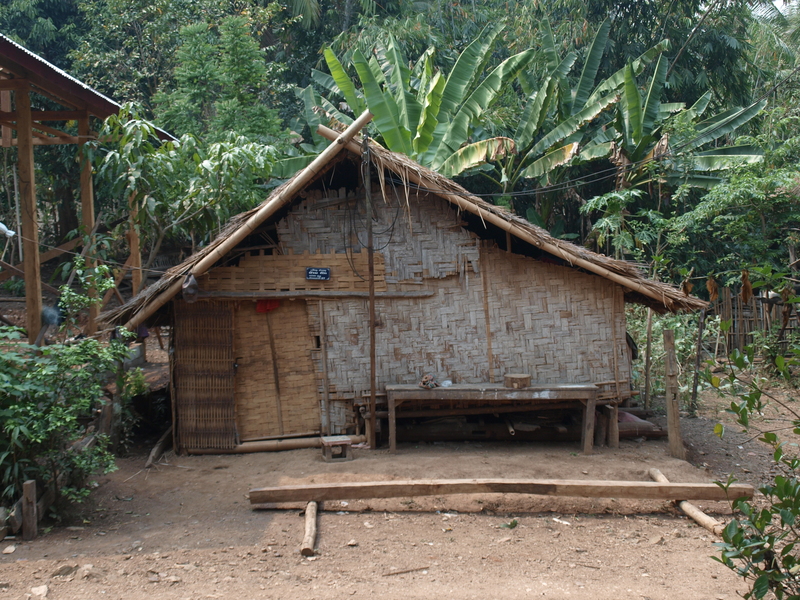 The poverty in these villages is somewhat shocking…there may be a house or two that have brick or concrete walls, but most are made of bamboo, thatch roofs and some plywood. You see homes and villages like this all over Laos and it made Kelly and I feel very fortunate to have such cush lives back home. Our hosts were very friendly and the food was delicious. After lunch, we began our kayaking down the Mekong, which made the hard trek worth it…the paddle down was absolutely stunning. Cute kid trying to get us to pay him $1 to set a bird free, which of course just flies right back to its cage. Lil' hussler! On our way back to town, we stopped at Ban Xang Hai, a small village where Lao Lao, the local whiskey is made. 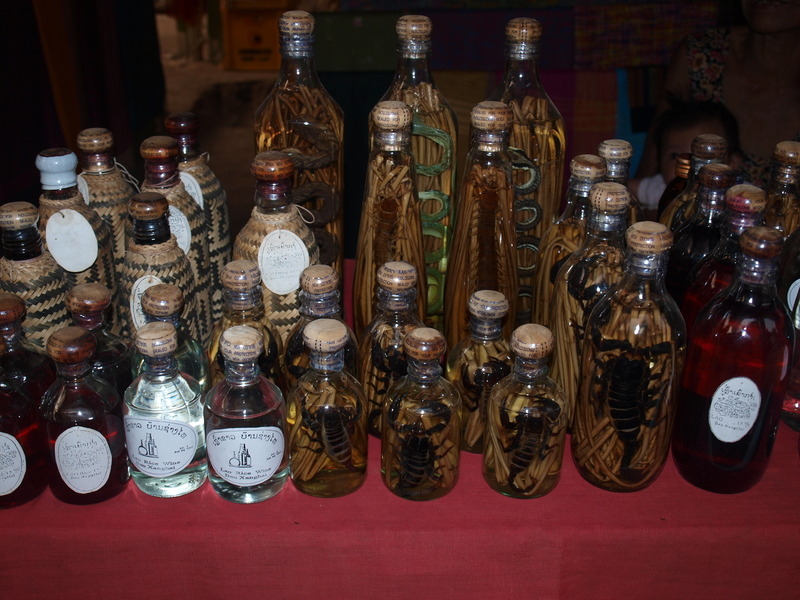 A lot of the whiskeys are poured into glass bottles with snakes, scorpions, centipedes…even a fricken bear paw…and are supposed to give you crazy dreams. We tried a few flavors sans insect/animal parts and it was pretty brutal. It tastes a lot like rocket fuel. 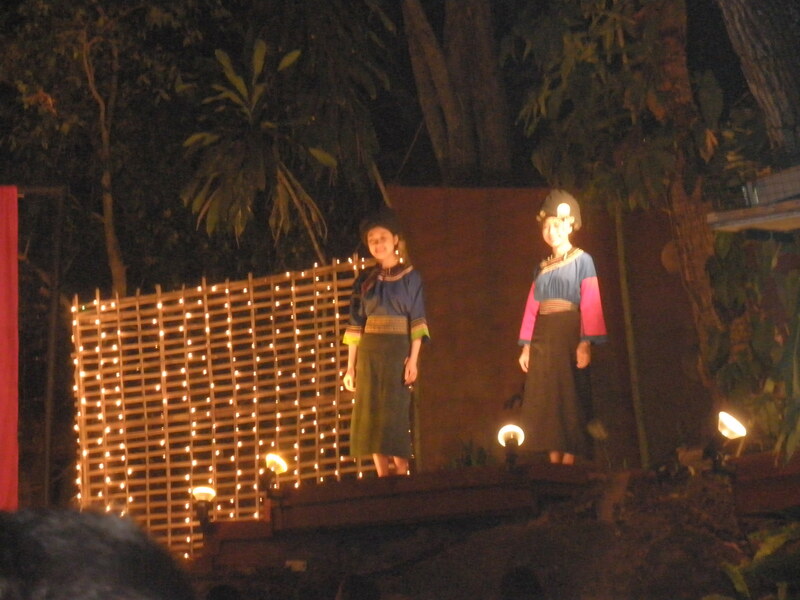 The rest of our evenings in Luang Prabang were spent wandering the nightly street market, cocktails at Hive Bar (along with a Lao village fashion show! 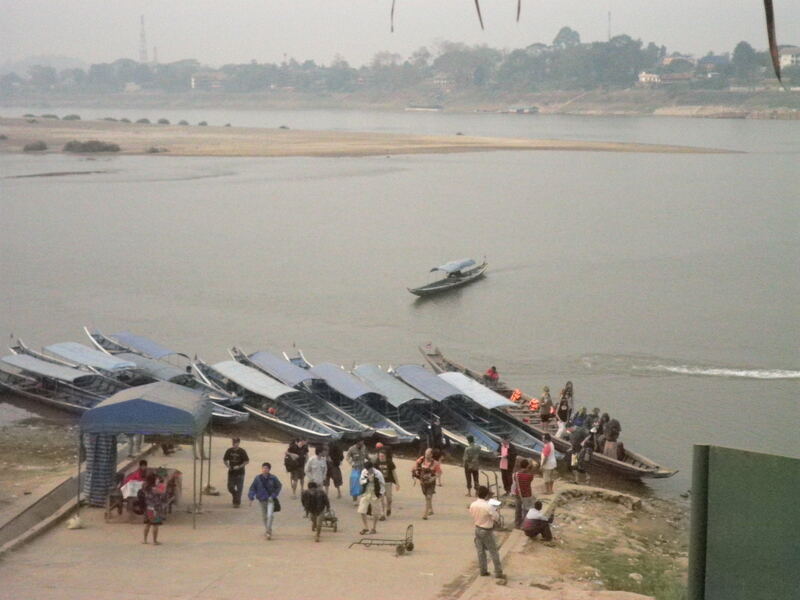 ), and dinner by the Mekong. One morning I dragged myself out of bed to watch the procession of monks, a tradition where monks collect their alms for the day. 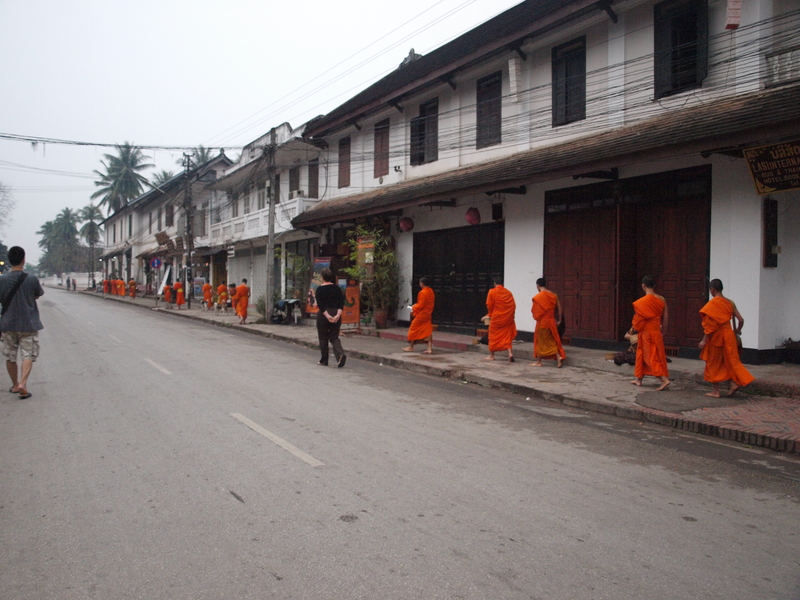 Every morning at 6 a.m. the monks of Luang Prabang walk along the main street, which is lined with local men and women seated on mats. 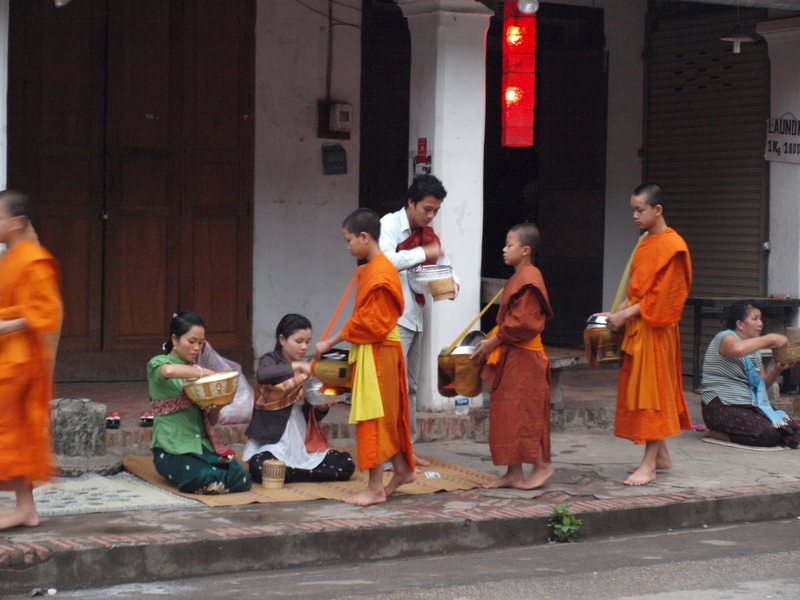 They place sweet cakes and sticky rice in the monks’ urns…this offering is the monks’ only food for the day. It is a beautiful custom to witness, despite having to watch a few tourists get right up in the monks’ faces to snap photos, which I found a little disrespectful. After 5 relaxing days here, Kelly, Megan and I headed to the party town of Vang Vieng to do some tubing and watch an obscene amount of ‘Friends’. Matt and I are still planning on meeting you somewhere…where are you gonna be in June?